What We Think We Become - Coaching and Leadership International Inc.
"The brain is capable of millions of different things. It can take us to a higher level of our existence, where we can actually understand the world in a deeper way, where we can understand our relationship to things and people in a deeper way, and we can ultimately make more meaning for ourselves and our world. We can show that there's a spiritual part of our brain, it's a part that we all can have access to, and it's something that we can all do." - Dr. Andrew Newberg M.D. Visionary Japanese researcher, Mr. Masaru Emoto, has published an important book, "The Hidden Messages in Water". Building on Emoto's research, when solving an issue CLI's Power Coaches are trained to ensure that our Clients connect with both sides of their brain for whole-brain thinking and that they anchor positive belief systems in the unconscious to replace the unconstructive. 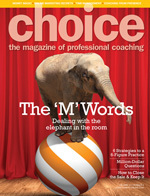 Power Coaches understand The Law of Belief - What we think we become. Our thoughts are our actions; therefore, we must be diligent about self-coaching and being Power Coached in order to gain more clarity and think more positively every day. "As a Counselor, Power Coaching� with Mind-Kinetics� provides me with the missing piece of the 'therapeutic process' puzzle. Counseling explores my clients' past patterns, and Power Coaching helps my clients look at their present, with an open mind and heart, in order to create a future they've always wanted." - Deborah Chamitoff, CPC, Victoria, BC.